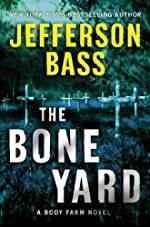 From Mysterious Reviews: Two murder mysteries duel for the forensic anthropologist's attention, though the one involving old bones takes center stage here. For fans of the series, there is a generous helping of forensic analysis to help close the cases, but it should also be said that there are passages that are exceptionally troubling to read. Synopsis (from the publisher): The onset of summer brings predictably steamy weather to the Body Farm, Dr. Bill Brockton's human-decomposition research facility at the University of Tennessee. But Brockton's about to get more heat than he's bargained for when Angie St. Claire, a forensic analyst with the Florida Department of Law Enforcement, asks him to help prove that her sister's death was not suicide, but murder. Brockton's quick consulting trip takes a long, harrowing detour when bones begin turning up amid the pines and live oaks of the Florida panhandle. Two adolescent skulls–ravaged by time and animals, but bearing the telltale signs of lethal fractures–send Brockton, Angie, and Special Agent Stu Vickery on a search for the long-lost victims. The quest leads them to the ruins of the North Florida Boys' Reformatory, a notorious juvenile detention facility that met a fiery end more than forty years ago. Guided by the discovery of a diary kept by one of the school's young "students," Brockton's team finds a cluster of shallow graves, all of them containing the bones of boys who suffered violent deaths. The graves confirm one of the diary's grim claims: that one wrong move could land a boy in the Bone Yard. But as the investigation expands, it encounters opposition from the local sheriff, who's less than delighted to find forensic experts from the state capital and the Body Farm digging up dirt in his county. As Brockton and his team close in on the truth, they find skeletons in some surprisingly prominent closets ... and they learn that the ghosts of the past pose perilous consequences in the present.